"Mercury in vaccines is a conspiracy theory! I've been told by numerous "skeptics" and doctors that there's no such thing as mercury in vaccines, and that any such suggestion is nothing more than a "wild conspiracy theory." That just goes to show you how ignorant all the skeptics, doctors and health professionals really are: They have NO CLUE what's in the vaccines they're dishing out to people! All they have to do is visit this CDC vaccine additives web page, which openly admits to these chemicals being used in vaccines right now. It's not a conspiracy theory, it turns out. It's the status quo of modern-day vaccine manufacturing! Now, consider this: The most common side effect of a vaccine injection is a headache. The CDCadmits that over 30 percent of those receiving vaccines experience headaches or migraines. Gee, think about it: What could possibly be in vaccines that would cause headaches, migraines and brain damage? Ummm, how about the mercury, the formaldehyde, the aluminum and the MSG! 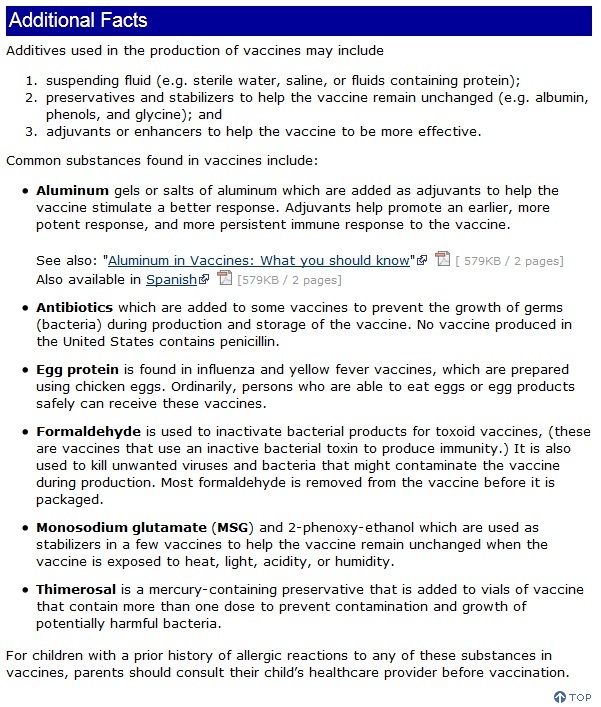 Even if you believe in the theory of vaccines as a helpful way to train the immune system to recognize pathogens, why would anyone -- especially a doctor -- think it's okay to inject human beings with mercury, MSG, formaldehyde and aluminum? The argument of the vaccine pushers is that each vaccine only contains a tiny dose of these highly toxic substances, and therefore it's okay to be injected with them. But this argument makes a fatal error: U.S. children are now receiving over twenty vaccines by the time they're six years old! What's the cumulative effect of all these vaccines, plus the mercury from dental fillings and dietary sources? What's the effect of injected mercury on an immune-suppressed child living in a state of chronic nutritional deficiency? Scientists don't know that answer because such studies have never been conducted. So they pretend that nothing bad will happen and keep pushing more and more vaccines on infants, children and even expectant mothers. They're playing Russian roulette with our children, in other words, where every injection could cause a seizure, coma, autism or death. Why doesn't the vaccine industry offer "clean" vaccines free from all toxic additives? If vaccines are supposed to be good for you, why do they contain so many additives that are BAD for you? You wouldn't want to eat mercury in your tuna fish. You wouldn't want MSG in your sandwich, and you certainly wouldn't want formaldehyde in your soda. So why would you allow yourself to be injected with these deadly substances? And just as importantly, why wouldn't the vaccine industry offer CLEAN vaccines? Without any brain-damaging additives? Think about it: When you buy health food, you want that health food to have NO mercury, NO MSG, NO aluminum and certainly no formaldehyde. No sane person would knowingly eat those neurotoxic poisons. And yet, astonishingly, those same people literally line up to be INJECTED with those exact same brain-damaging poisons, with the justification that, somehow, "This injection is good for me!" Absurdly, the vaccine industry says these toxic ingredients are intentionally added to vaccines to make them work better! Yes, that's the reason: Mercury makes vaccines work better, they insist. Click here to see a video news report actually claiming mercury makes vaccines work better, granting children "improved behavior and mental performance." No, I'm not making this up. The mainstream media literally claims that mercury is GOOD for babies. Vitamins might kill you, they say, but mercury is good for you! But hold on a second: I thought the theory behind vaccines was that weakened viruses would give the immune system a rehearsal so that it would build up antibodies to the real thing. Where does mercury, MSG or formaldehyde fit anywhere in that theory? Does your body benefit in any way from exposure to formaldehyde? Of course not. The very idea is ludicrous. So are there such things are clean vaccines? I challenge you to try to find one. They simply don't exist for the population at large. Nearly all vaccines for the masses are deliberately formulated with neurotoxic chemicals that have absolutely nothing to do with the science of vaccinations, but everything to do with autism, Alzheimer's disease, early-onset dementia, immune suppression, and the mass dumbing down of brain function. That's the real purpose of vaccines: Not to "protect children" with any sort of immunity, but to inject the masses with a toxic cocktail of chemicals that cause brain damage and infertility: Mercury, MSG, formaldehyde and aluminum. The whole point of this is to dumb the population down so that nobody has the presence of mind to wake up and start thinking for themselves. This is precisely why the smartest, most "awake" people still remaining in society today are the very same ones who say NO to vaccines. Only their brains are still intact and operating with some level of awareness.